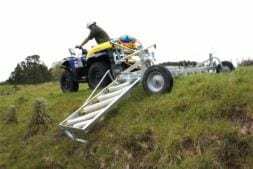 As weed wipers become a more effective means of applying herbicide, the practice of wiping, as opposed to spraying, becomes an increasingly popular alternative for many landholders. It can be difficult maintaining a weed management program with conventional spraying. Windy days often rule out spraying at times, when we really need to be out on the land keeping the weeds in check.. Controlling drift and run-off in sensitive areas can also be an issue that forces us to consider alternatives to the normal tank and boom concept. Another important element is the manner in which the chemical is transferred to the weed. For this process to be optimised, the wiper needs to have a larger surface area to potentially contact target vegetation. The wiping surface must be manufactured from a durable material, which does not drip chemical on to grass as the machine moves around the paddock. The Eliminator Weed Wiper incorporates long geometrically shaped wiping arms, designed after extensive trialling to determine the best possible shape and size for the purpose. The actual wiping arms are made from natural wool, and needle punched into synthetic webbing to provide added durability. 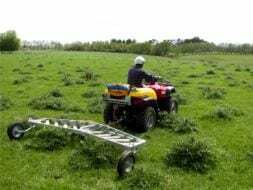 “It is unusual to encounter a uniform level of weed infestation across an entire paddock,” Mr Hunt said. “We therefore decided that it was desirable to provide the operator with a means of electronically controlling the chemical output of the wiper, relative to the immediate level of infestation. “The Eliminator’s electronic controller is a key distinguishing feature between today’s technology and the old, wasteful ‘near-enough is good enough’ approach of the past. “Another primary feature, which is often overlooked, is the importance of supplying an equal amount of chemical to both sides of the wiper, irrespective of the angle of operation. Other wipers are notorious for dripping on the downhill side, while being bone dry on the high end. “Eliminator, however, has a patented feed system that ensures both sides are fed equally on even the roughest terrain.” Eliminator is available with an optional onboard tank to provide the convenience of a self contained unit. Alternatively, the Eliminator is compatible with the full range of C-DAX 12-volt sprayers. Eliminator Weed Wipers are available in either the standard 2.3 metre width or the new Winged Eliminator which has a 4.3 metre wiping width. The wings on the Winged Eliminator are articulated so they can follow the contour of the ground in undulating country.